Time has no mercy, and what used to be a gigantic glorious sculpture can be reduced to ruins today. This, however, does not mean there is no hope for the avid historian who wishes to enjoy archeological pieces coming back to life. Restoration techniques have improved greatly over the years and, luckily, new materials are being incorporated to make the job possible. The “sitting colossus” was broken into 370 pieces -including its 16 tons head-, and represents Ramses II (1279 – 1213 BC), one of the greatest pharaohs of the New Empire. The “standing monarch”, is 120 tons and 13 metres high and represents the Pharaoh Seti II (1200 – 1194 BC). Epoxy resins, which are increasingly used in new artworks are also becoming crucial in restoration projects of old sculptures, façades and monuments of all kinds. Spanish archeologist Miguel Ángel López Marcos knows it well, as he has been restoring stone giants for fourteen years now. His most recent ‘resuscitation’ involved working with two pieces found in Cairo which had been immersed in mud for centuries. The first colossus, “the standing monarch”, is 120 tons and 13 metres high and represents the Pharaoh Seti II (1200 – 1194 BC). The second one, “the sitting colossus”, twice as heavy, was broken into 370 pieces -including its 16 tons head-, and represents Ramses II (1279 – 1213 BC), one of the greatest pharaohs of the New Empire. Once the actual damage had been assessed, López Marcos was determined: “We must intervene”. He came to the rescue armed with epoxy glue. The “standing monarch” returned to its majestic position once the bust (38 tons) was lifted using some belts sewn with steel bolts and reinforced with epoxy resin. 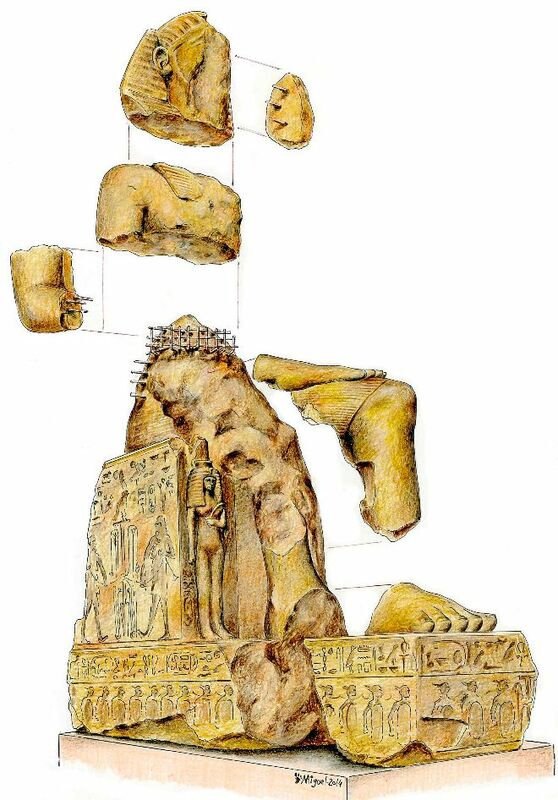 The beheaded Ramses II regained its original shape after an arduous process that included “sewing” a big vertical crack using epoxy and steel bolts. The rest of the bust, which was only connected to the body by 10 cm, was back in place thanks to a prosthesis made of epoxy resin, gravel and sand. Once the restoration is completed in few months, the standing monarch will be part of a temporary exhibition at the Egyptian Antiquities Museum in the Tahrir Square. The colossus of Ramses II will be transported to the Great Egyptian Museum, close to the Pyramids of Giza. This time, the epoxy on them will make sure that the two colossi can face the passage of time in much better shape. Read the full story by El Mundo (translation provided by Google Translate).